Our well-appointed, ground floor, completely remodeled condo is waiting to welcome you in to RELAX. The breathtaking ocean view straight out onto the waves will thrill you the moment you enter into our home. "WOW!!" As our guests, we are confident that you will love it as much as we do each time we walk through the doorway. •	Once you have settled in, take the relaxing stroll along the waterfront into the quaint town of Kailua (Note: there are a couple of great coffee shops that open early each morning, allowing you to sit outside and watch the waves splash on shore -- or brew your own Kona coffee in our condo and enjoy your private lanai). •	No need to hassle with driving - the shops and restaurants, spa and even a luau - are all within easy walking distance along a quiet side street. •	Or you can keep busy from morning 'til midnight, exploring the Kona Coast - hiking, biking, birding, fishing, snorkeling, scuba diving, exploring remote beaches, the active volcano, green and black sand beaches, etc. •	We (3 sisters) want to assure you that we will be attentive and responsive to your needs as our guests. Note: We are OWNERS -- not a property management business -- so we invite you to enjoy our Kona Home! The Kona Reef is located within walking distance of everything in Kona. The management of this complex is very attentive to detail and safety of all the guests. The public gardens, pool area and ocean front is immaculately tended. 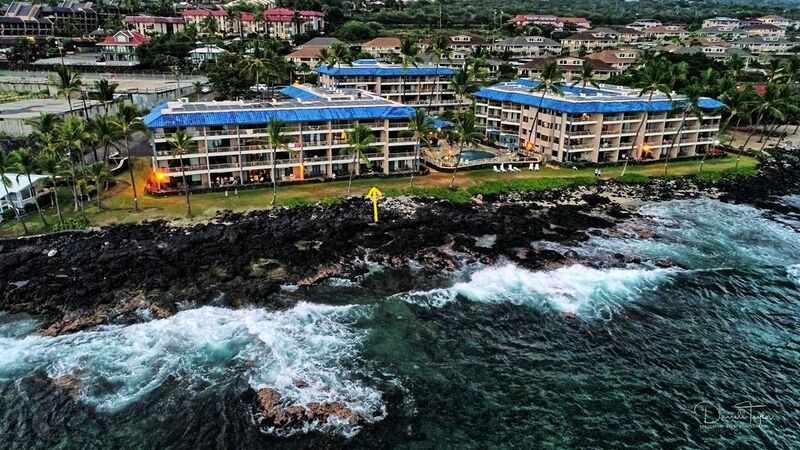 AND ... the view of the waves is spectacular from our condo -- we love counting the black and yellow Tang we see in the clear waves as they crest just steps off our lanai! The sunsets, the fresh breezes, the glorious sunshine, the views of the waves, fish, dolphins and surfers -- all are often a distraction to the good books we are trying to read! We are able to rest and refresh and rejuvenate in our special Kona time! We invite YOU to experience this in our home! 1 newly remodeled walk-in shower, with bench area. Steps away from the water! GLORIOUS views! Air conditioner in the living room -(set on a 60min timer). Ocean breezes, windows and ceiling fans mean we rarely have use the AC! In the bedroom, we have another AC unit and a quiet ceiling fan. New front loading machine -- and we have a wooden drying rack available for you as well and a place to hang dripping suits and towels out on the lanai so they dry in the beautiful ocean breeze. We have bath towels for use IN the condo, as well as beach / pool area towels to take outside. Stainless-steel carafe drip pot. We also have a coffee grinder for your use. Out coffee maker has a gold (flat-bottom) filter (and there are paper filters in cupboard if you prefer). Fully stocked if you want to do any cooking or grilling while you are enjoying our home. Two round dining tables: One inside the condo and one on the lanai. There are 4 chairs that fit nicely around either table. We purchased a 'smart tv' for the living room area -- so you can connect (with an app) to all your own TV / movie access apps easily. There is a wall-mounted TV in the bedroom as well. Enjoy an array of books that previous guests have left for your enjoyment. Relaxing in the condo or out on the lanai is luxurious and refreshing. We have just purchased a new KING bed so you can plan on a good night's sleep, too! The AC in the bedroom is a bit noisy ... but it cools off the room within a few minutes and then the ceiling fan can purr quietly all night to keep you cool. In order to keep it healthy for everyone, PLEASE -- No Smoking in the condo or on the lanai. There are two designated smoking areas at the condo complex up by the road (with shade, chairs and tables). PLEASE do NOT smoke in our condo or on the lanai! There is a $200 fine that the condo association can levy if another guests reports smoking on ANY lanai in the complex. The condo is ocean front and we could not get enough of that view! We walked out on the reef and spotted a sea turtle right away! We named him Horace and would look for him each day! The condo had everything we needed and then some! The additional air mattress on hideabed was way more comfortable than the typical mattress! We also enjoyed the ocean front pool and spa! The owners provided great information on places to go and instructions. We could walk next door to resort and have happy hour drinks at sunset and walk to town and shop within 5 minutes! We enjoyed Kona Reef and will be back! I am delighted that you & your family so thoroughly enjoyed your time in our Kona home. You are WELCOME to return any time! I’ll look for “Horace” the next time we’re enjoying coffee on the lanai. Comfortable condo with great view! This condo was terrific. Sit on the lanai and watch the surfers, listen to the surf. The bed was firm and comfortable. The kitchen was well stocked and all of the appliances worked. Arrival and departure were easy and the condo was clean when we got there. The owner is responsive and easy to communicate with. It is clear that the owner cares about her property and her guests. My husband & I stayed here during our Hawaii vacation & didn't want to leave! The condo was very comfortable, and Debi was very friendly & responsive. The owners had thought of everything, and the location was fantastic. It was within walking distance of downtown, with restaurants and shopping, and the view was fantastic! We spent many hours on the lanai watching the waves and surfers. The air conditioning was nice to get the humidity out of the air, but as they admit, it was a bit noisy; however, we didn't use it very much, so that wasn't really an issue. There was every Even thought we didn't use them, there was a small beach within walking distance, as well as a pool and hot tub. We will definitely choose this unit if we come back! Has everything you need. Great location. All the condo necessities. Parking. Sea turtles and dolphins. The bedroom is a bit stuffy with a very noisy air conditioner but we were able to sleep well if we turned off the air conditioning after cooling down the room. We so enjoyed staying in your condo. So well appointed, it is evident the thought and care you have put into making sure your guest have everything they need. The ocean views are breathtaking. Thank you again and we will see you again soon! Loved the location. On water and close to shops. Parking available. We used the beach equipment provided. Kitchen supplies very handy. Debi was VERY helpful and friendly. Highly recommend!! We have made our condo into a 'home-away-from-home' with all the amenities necessary to enjoy your stay. Hawaii Tax ID# 066-750-6699-01 Here is our REFUND POLICY: Please understand that cancellations after the deposit is made will forfeit the deposit (although some exceptions may apply). Cancellations made within 30 days of reservation are non-refundable unless unit is rented to another guest. There are no refunds for arriving late, early departure or ‘no shows’. We advise guests to purchase Trip interruption / Cancellation Insurance if you think it wise.